The Rev. Jennifer Potter holds Abigail Bedu Addo during her baptism at Wesley’s Chapel in London. The congregation, with roots in the 18th century, draws Methodists from around the world. With John Wesley’s study chair, Charles Wesley’s organ and the Museum of Methodism on-site, it would be possible to conclude that Wesley’s Chapel & Leysian Mission is stuck in time — the late 18th century, to be exact. While still welcoming visitors who want to see the church that Wesley — the founder of Methodism — built, the current congregation is firmly focused on the denomination’s presence in the community and contributions to global Methodism today. The Rev. 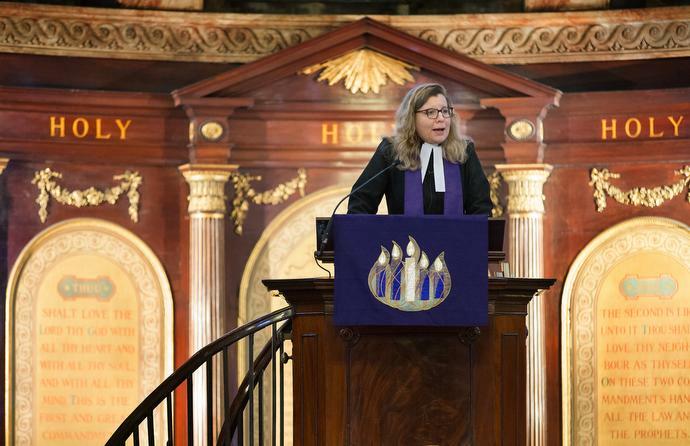 Jennifer Smith gives the sermon during worship at Wesley’s Chapel, where she serves as superintendent minister. Photo by Mike DeBose, UMNS. Identity is important, says the Rev. Jennifer Smith, who became the superintendent minister of Wesley’s Chapel in September 2017. Smith added that there are riches to conserve and pass along to younger generations. 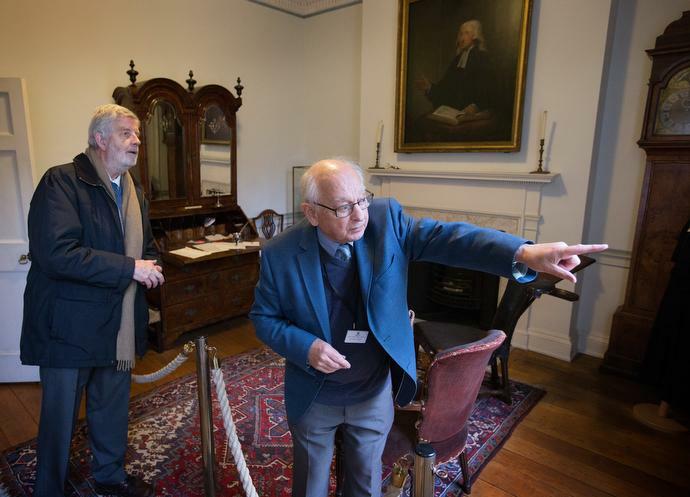 Tour guide Allen Steel (right) points out the gravesite of Susanna Wesley, mother of John and Charles Wesley, through a window in the study at Wesley’s Chapel. At left is the Rev. John Lampard, a retired minister and member of the congregation at the historic church. 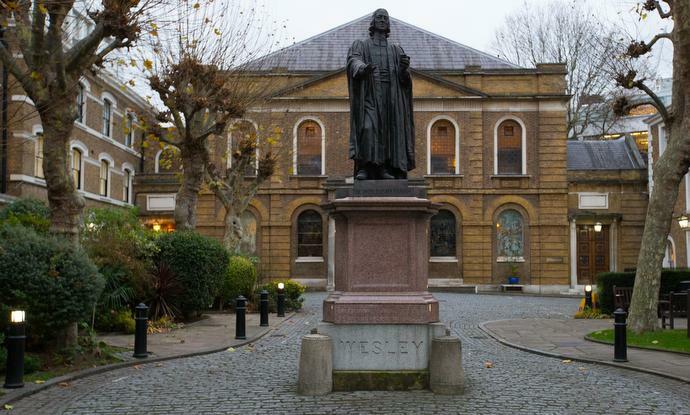 A statue of John Wesley sculpted by John Adams-Acton stands in the forecourt of Wesley’s Chapel. Photo by Mike DuBose, UMNS. Wesley’s heritage also is reflected in the national flags which ring the sanctuary’s balcony, representing the diverse congregation. 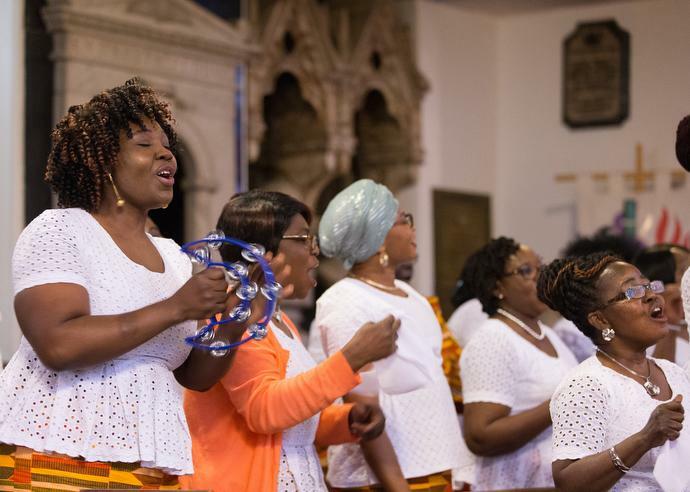 The upwards to 500 members include British citizens of African descent as well as Methodists from Fiji, Tonga, Hong Kong, China, Japan, South Korea and the Philippines, the U.S., Latin America and Europe. On a wintry morning in December, the falling snow and slushy streets apparently convince many of the 300 regular Sunday worshippers at Wesley’s Chapel to stay home and watch the Advent service via livestream. Smith preaches and the Rev. Jennifer Potter is the worship leader. The Ghana Fellowship sings and an ensemble featuring piano, cello and violin plays Bach. 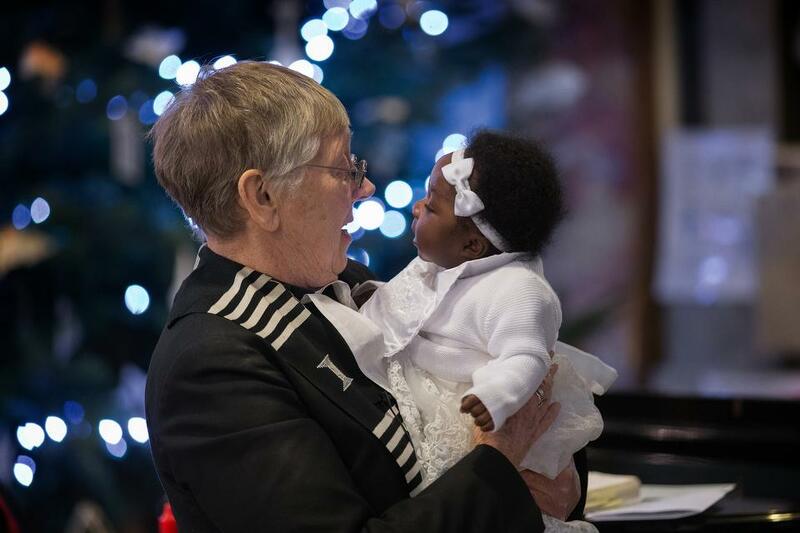 A highlight of the service is the infant baptism of Abigail Bedu-Addo. Her family has a long connection with Wesley’s Chapel, Potter explains, “although they live some considerable distance away.” Despite the weather, the baptismal party fills all four of their reserved pews. After the ceremony, Potter carries the happy, curious baby around the church while the Rev. Keith Riglin presents the candle used in the baptism to the parents. Riglin, an Anglican priest, is married to Smith. They are not the only ecumenical couple at Wesley’s Chapel. They are among those attending a fellowship time after the worship service, which features a wide array of food to celebrate the baptism. Also partaking of the festivities is Victoria Yamoah Pedanou, a member of the Ghana Fellowship, which was started about a decade ago. The fellowship meets on the fourth Sunday of the month and about half participate in the choir that sang during the service. “We help those who are in need and we visit the sick,” she adds. While a statue of Wesley beckons people to the chapel, there have been many changes since the chapel was built in 1778. In fact, problems with a crumbling foundation “nearly ended its life in the 1970s,” said Potter. The building was out of commission for about five years, but was re-opened by Queen Elizabeth on its 200th anniversary. Worship is “a serious business” at Wesley’s Chapel, noted the Rev. John Lampard, a retired minister and congregation member. He compared the staffing to that of a United Methodist church in the U.S., with a shared leadership model and two full-time lay workers. Harriet Appiah-Anderson (left) sings with the choir at Wesley’s Chapel. She is chair of the church’s Ghanaian fellowship. Photo by Mike DuBose, UMNS. Being a place of pilgrimage remains an important component of its presence, said Lampard, whose wife, Judith, is one of the heritage tour leaders. Every Sunday, they have visitors from around the world and the recently renovated museum has a “top-drawer,” full-time curator who trained at the Victoria and Albert Museum, he added. A learning support officer makes the school visits. “As far as Methodism is concerned, it is a center of excellence,” Lampard declared. Beyond the gates, the church’s neighborhood in the borough of Islington has undergone many changes as well. Many people moved out of the area after World War II, Potter explained, but in recent years a more diverse population has moved in, with a resurgence in building. Today, about a quarter of the congregation is local, while others travel in from elsewhere for services. 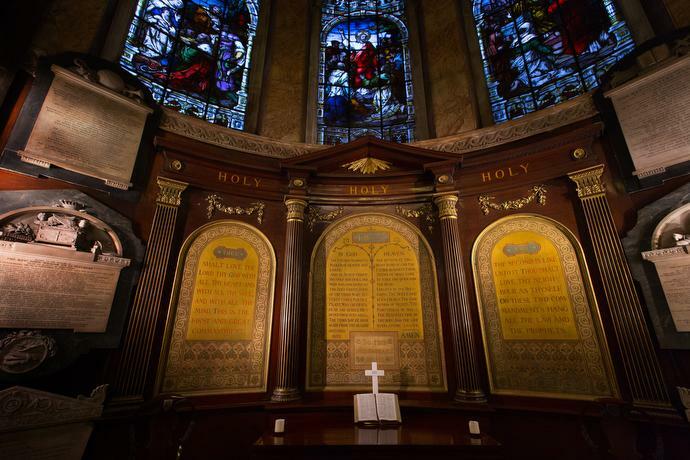 Through the Islington Faiths Forum, Wesley’s Chapel has close links with two local mosques. Joint projects, she said, have included leader development training programs for schools and faith literacy. In recent months, a program to encourage people to report hate crimes has been added. A tragic incident in June 2017, when a van rammed into a group of worshippers near Finsbury Park Mosque during Ramadan, “actually sparked off a wave of enormous support for the local mosques,” Potter noted. The van’s driver, Darren Osborne, has since been convicted of murder. In the past decade, an area not far from Wesley’s Chapel has become known as the “Silicon Roundabout” because of the presence of high-tech industries. One of the questions Smith has been pondering is how to relate to the tech crowd, as well as “the hipster Shoreditch culture,” as she referred to th trendy neighborhood. People will attend a 7 a.m. spinning class to seek transformation through a motivational life guru, she pointed out, but somehow the church has lost the skill that John and Charles Wesley had in preaching transformation in the language of their own day. Smith has had her own journey to Methodism. An American who grew up in a Congregationalist home, she said she was “loosely” affiliated with the Church of England after moving to England at the age of 21. Then, while working as a lecturer at the University of Leicester in her late 20s, she came upon a Methodist-Baptist congregation. 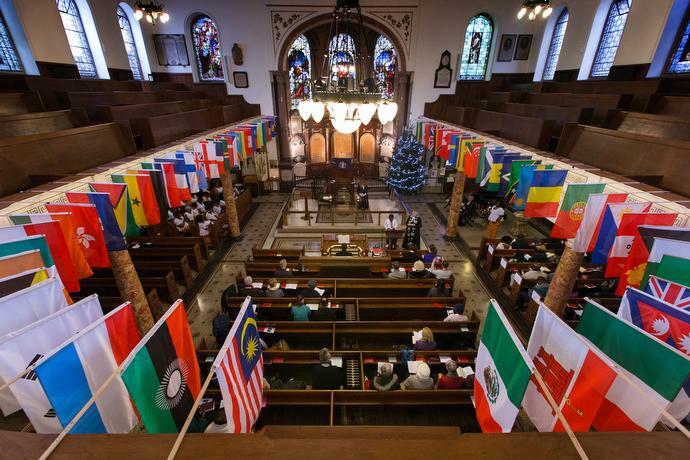 Flags of the nations represented by the diverse congregation of Wesley’s Chapel ring the balcony of the historic church. John Wesley’s Communion Table is a central feature of Wesley’s Chapel. What also gives her perspective, Smith said, has been the opportunity to travel. For nine years, she made an annual trip to Nigeria to spend a month teaching a program in applied evangelism. Bloom is assistant news editor of United Methodist News Service and DuBose is a photographer for United Methodist Communications. This story was originally posted at umc.org and has been used with permission.